The US-based English star, 26, stumbled to a final round 73 at Huntingdale to win by two shots from Aussies Richard Green and Greg Chalmers on 12 under par. Rose's last win came in the 2002 British Masters, but after an early triple bogey eight at the par five seventh, he played the remaining holes in one under to jump to fifth on the European Tour Order of Merit. Rose said: "It was a rollercoaster. I was really pleased though that my emotions didn't rollercoaster. "I stayed very clam, even when I made triple on the seventh I said 'well you are tied for the lead, game on' and it was awesome to bounce back with a birdie on the eighth." Aussie amateur Aaron Pike was fourth on nine under par after a closing 74 but it was a day to forget for Irish duo Damien McGrane and Gary Murphy. McGrane dropped four shots in the first five holes but did well to shoot a 75 and claim 25th place on one under. But Murphy crashed to 57th on five over after a closing 78 that featured just two birdies and six bogeys. Brett Rumford’s dramatic eagle in sudden death gave him his first win since 2007. 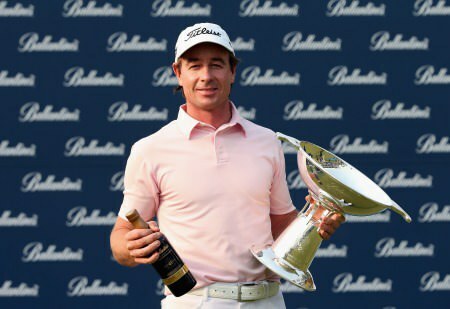 Picture © Getty Images Former Irish Open champion Brett Rumford hit a sensational five iron to four feet on the first extra hole to set up an eagle and victory in the Ballantine’s Championship in Korea.